The Britannian Mining Company (BMC for short) is an agency that started operating in Britannia during the time of Ultima VII and oversaw the excavation of industrial ores from various sites throughout the kingdom. At the time of the Avatar's adventures in the early Age of Armageddon, the BMC had two active mines within the kingdom. One, operating out of Minoc under the supervision of Gregor, was processing ores found within the corridors of the Dungeon Covetous - which included the covert extraction of the magic-nullifying blackrock, a mineral being used by BMC-affiliated Fellowship members to build various devices for the Guardian. In this key mining site, fast and inexpensive labor was crucial to maintaining the illicit blackrock production, and to this end gargish workers were routinely drugged with silver serpent venom, that they might work for longer hours. The haste of the enterprises also resulted in a great deal of waste runoff into the local river, which contributed significantly to the pollution of Cove's Lock Lake in the years before the passage of prohibitive legislation regarding such dumping. The second mine, operating near the newly resettled town of Vesper under Cador, appeared more modest in the scope of its endeavors, and seemingly had fewer unsavory labor practices, despite the rampant racial tensions of the nearby settlement. Curiously, Batlin would describe this site in his Book of Fellowship, as being the head branch of the BMC - an odd statement given its comparative size and remoteness to the Minoxian branch. It may be that such a claim was made by the Fellowship leader as a means of misdirection, given that the bulk of blackrock extraction appeared to be taking place in Covetous. Eventually, the years of the Reformation turned the public gaze onto all BMC operations, as the adventures of the Avatar regarding the black gate had done much to expose the exploitative practices of the company. In the year following the dismantling of the Fellowship, much was reportedly done to adjust the labor laws as regarded mining, with mayor Burnside taking a lead role in the reforms. In the years that followed, however, the ravages of the Imbalance and the Great Cataclysm dramatically changed the landscape of the world, causing the land which once held Vesper to sink into the ocean and destroying the original City of Sacrifice in the upheavals of the earth. Decades later, during the Avatar's return in Ultima IX no record or trace of the Britannian Mining Company could be found, although abandoned blackrock mines (which had apparently operated publicly for some time) were still present within Covetous' depths. 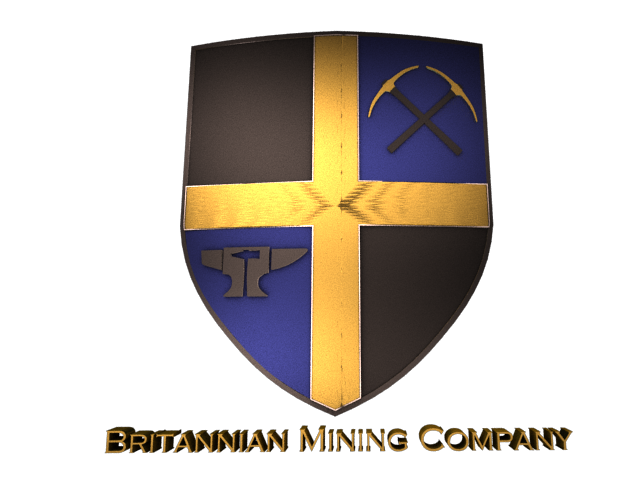 On June 6, 1998, the Britannian Mining Company was founded in Ultima Online. 15 years later, after digging through iron, dull copper, copper, shadow, bronze, agapite, verite, and valorite ore as well as tons of blackrock, the Britannian Mining Company made it's way to Shroud of the Avatar on December 3, 2013. The main membership of the Britannian Mining Company comprises of and endeavors it's search efforts for players that have interests in, but not limited to, business management, economic theory, parliamentary procedure, raw material production, and metallurgy. There are four (4) subsidiary guilds that flank the Britannian Mining Company and are available to the membership. The Britannian Mining Company Military (BMCM) houses the PVP players of the Britannian Mining Company that are committed to combat against other players and guilds. The Barefoot Moonshining Cousins (BMC) houses the "alternate" characters of the Britannian Mining Company membership that wish to have all their characters under the Britannian Mining Company banner. The Black Hand (TBH) houses the "alternate" rogue characters of the Britannian Mining Company membership that wish to develop a reprobate character anonymously that is committed to all facets of unsavory, distasteful, objectionable, and offensive gameplay. The Secret Order of Blackbows (SOB) is a guild from Ultima Online, co-founded by the Britannian Mining Company, that houses characters that are dedicated to gank squad tactics in archery. All members display their guild family pride by giving their character the Surname of Blackbow. When the capitol metropolis of Blackrock Cove and surrounding player owned towns are complete, the guild invites travelers from near and far to share in it's rich history and stories of adventure while enjoying a drink of the finest brew at Lock Lake Tavern. If it's commerce that you seek, then visit Market Road where the Britannian Mining Company keeps it's vendors stocked with the on-time, on-demand, material that has made the guild renowned throughout the lands! The Britannian Mining Company has been part of your community since Ultima VII and Ultima Online and looks forward to the development of Shroud of the Avatar for many years to come! Join us as a member or as a friend stopping by to say, "Hello" at the guild's official TeamSpeak3 voice server at: bmcguild.enjinvoice.com today!